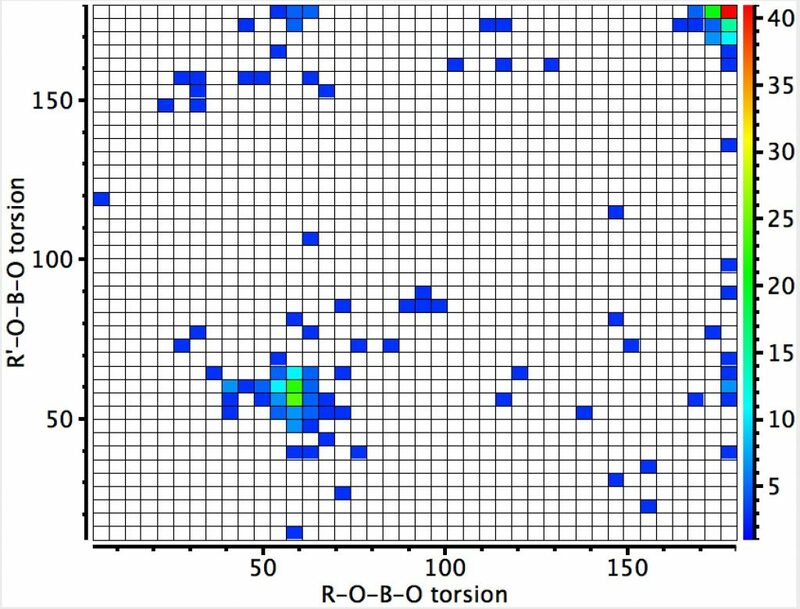 Anomeric effects at carbon involving lone pairs originating from one or two nitrogens. Anomeric effects at boron, silicon and phosphorus. The anomeric effect occurs at 4-coordinate (sp3) carbon centres carrying two oxygen substituents and involves an alignment of a lone electron pair on one oxygen with the adjacent C-O σ*-bond of the other oxygen. Here I explore whether other centres can exhibit the phenomenon. I start with 4-coordinate boron, using the crystal structure search definition below (along with R < 0.1, no disorder, no errors). The result shows two prominent clusters, one with both torsion angles being 180°, and another with both being ~60°. This latter is the one that implies that there must be two lone pairs, one on each oxygen, that are anti-periplanar to the adjacent B-O bond. There are two more diffuse clusters where only one antiperiplanar alignment is seen. 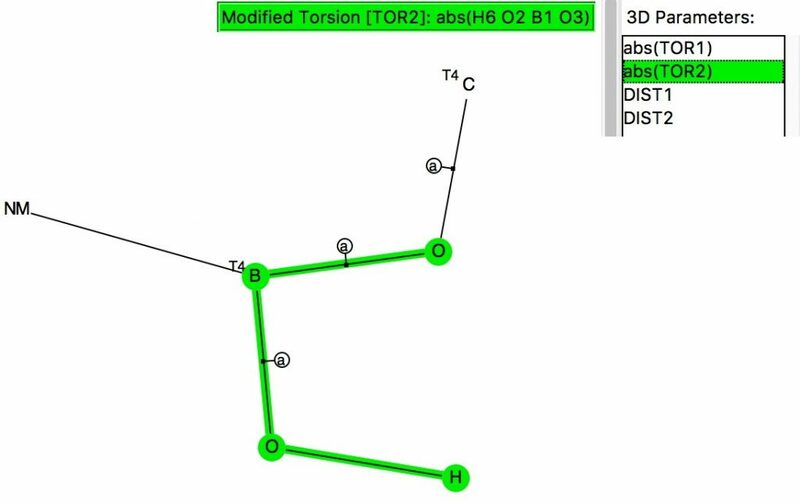 So yes, 4-coordinate boron can exhibit an anomeric effect! 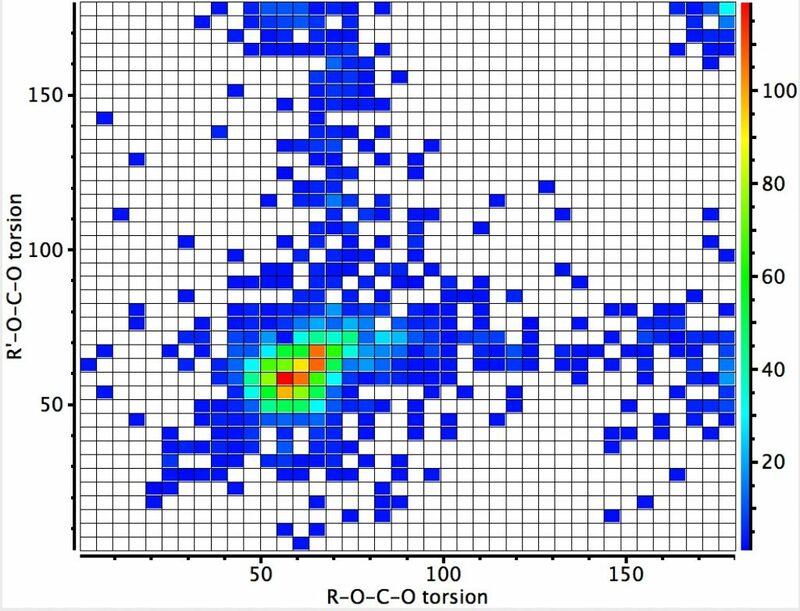 This compares to the carbon-anomeric plot which is shown here for comparison, where the top right cluster of 180° torsions contains proportionately few hits than with boron. The next centre is at 4-coordinate silicon. Again three significant clusters are seen; one with two antiperiplanar lone pair alignments with Si-O bonds, and two more with just one such alignment. The previous hotspot for which both measured torsions were 180° is largely absent. So here, the anomeric effect is much stronger. 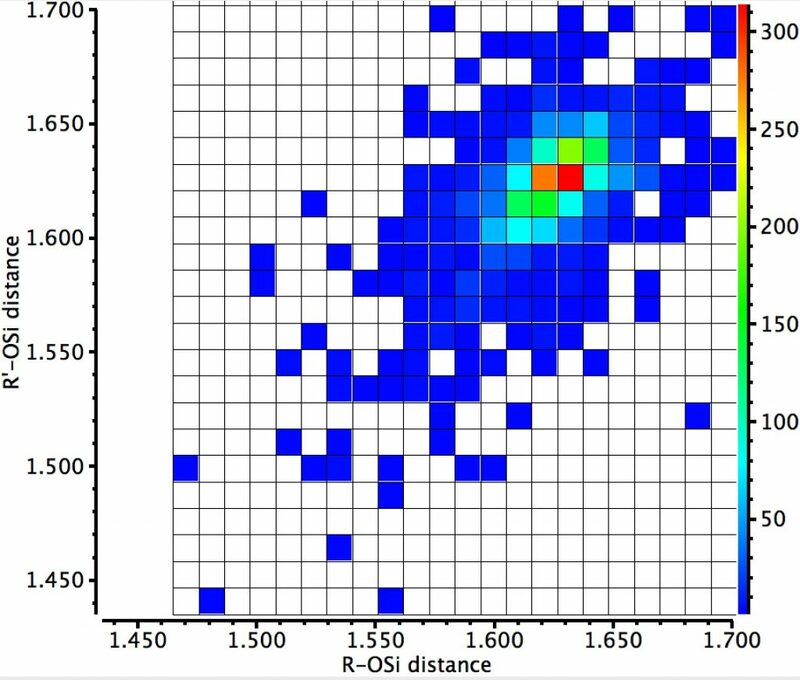 Notice also that whereas the torsions in the region of 60° for the carbon centre lie along a ridge coincident with the diagonal (bottom left to top right), that for the silicon centre show a ridge running orthogonal to the diagonal. An interesting point to follow up perhaps? 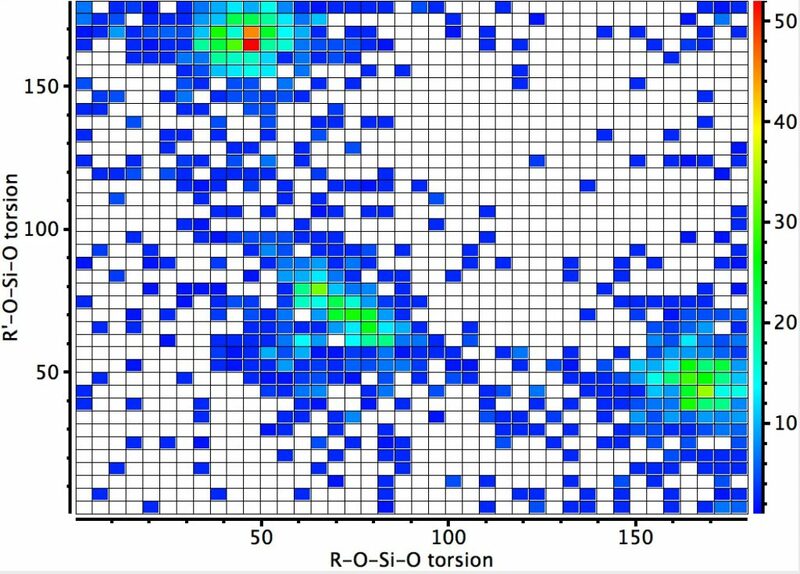 Since the off-diagonal clusters are relatively prominent, implying just one anomeric interaction, it is of interest to see if this results in any asymmetry in the two Si-O bond lengths. If its present, the effect is small. Finally 4-coordinate group 15 elements. Most of the hits are in fact for P; there are none for N. This shows four clusters; the two on the diagonal show respectively two and no antiperiplanar interactions. The two off-diagonal clusters show just one such orientation. As with Si, the ridge in the 60° region run orthogonal to the diagonal. So this little exploration shows that the anomeric effect, best known for sugars and at a carbon centre, is in fact more general to the adjacent elements. This entry was posted on Friday, July 1st, 2016 at 7:47 am and is filed under crystal_structure_mining. You can follow any responses to this entry through the RSS 2.0 feed. You can leave a response, or trackback from your own site. 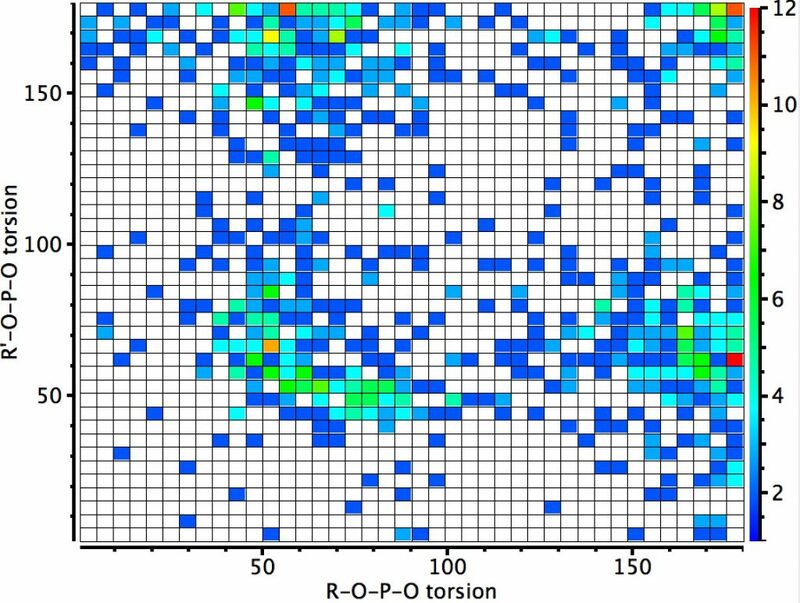 Anomeric effects at boron, silicon and phosphorus. is licensed by Henry Rzepa under a Creative Commons Attribution-Noncommercial-Share Alike 3.0 United States License.